As men grow older, the testosterone responsible for libido tends to bind to globulins in the blood instead of stimulating the brain’s centers.Natural plant extracts have been shown to enhance sexual desire, performance, and gratification. These extracts also have been shown to be free of side effects. 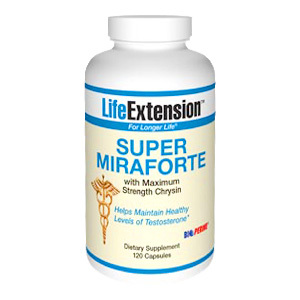 Life Extension offers a standardized muira puama extract combined with a nettle root extract, zinc, Peruvian ginseng (maca), and chrysin in a preparation called Super MiraForte. For adult men, take two capsules in the morning and two in the evening, or as recommended by a healthcare practitioner. Do not take more than 15 mg per day of Bioperine®. If you are taking any medication, use only under physician supervision. Men with prostate cancer should not use this supplement. An elevation in free testosterone can unmask an occult (hidden) prostate cancer. Therefore, we advise anyone with this concern to have a baseline PSA (prostate specific antigen) test prior to use of this product and a follow-up PSA test 60 days later. If a significant elevation of PSA is found, discontinue this product and advise your physician. 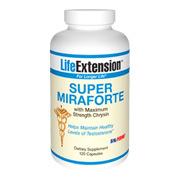 Super Miraforte w/Max Strength Chrysin - is shipped in a discrete, unmarked package. Orders are processed immediately and usually take about 3 to 5 working days to be received. We do ask that you try it for 2 to 3 weeks to feel the full effects. Any information received is used only for order processing and shipping purposes. Your information, such as e-mail address, will never be disclosed to a third party.